As many of our clients know, we have been in the brow industry for over 30 years. Brows for us meant shaping and tinting, when needed. We are now excited to announce we also off Brow Feathering. 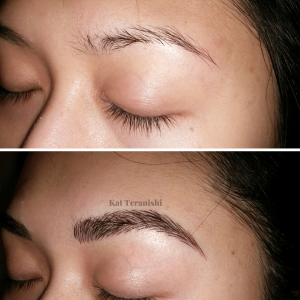 Brow Feathering (also known as Micro-Blading) has quickly become a fast growing trend. Brow Feathering is a form of brow tattooing, but unlike traditional solid colour brows, tiny hair-like strokes are used that result in more natural looking brow. Kathryn has joined our Cecil B. team to offer this service and we are so excited to have her. You can read her biography here. One of our staff members, Thi, had her brows done last week and we were able to view the entire process from start to finish to share with you. Kathryn started by conducting a very thorough consultation to determine what shape, density, and colour Thi was looking for. Once the shape was decided, Thi had to sit with numbing cream for about 20 minutes. Once she was numb, Kathryn did the first pass of the tattoo and then applied a different type of numbing cream. She then continued with two more passes of tattoo checking Thi’s comfort and adding more numbing cream as necessary. The entire process from start to finish was about 2 hours. Once the process was complete, Kathryn ensured Thi was aware of the aftercare process and any do’s and don’ts’. Aftercare includes keeping vaseline on the brow area for about 5 days to protect it from any moisture or bacteria (including in the shower). Thi was instructed to stay away from any major exercise/sweating for at least 4 days and to try and sleep on her back. She was told that the brow colour would fade about 30% and that she needed to have a touch up in 6 weeks. This touch up appointment would allow Kathryn to view the fully healed brows, to do any minor colour adjust, and add if more feathered strokes were wanted. Until the end of May, Kathryn is offering this service at a promotional price of $400, instead of $500 (touch up included). Contact us with any questions or to book an appointment. So interested in getting this done! You could always start with booking a free consultation with Kathryn. She’s here Tuesday, Wednesday, and Thursday. We think you would love the results! Wow that looks very good, i was wondering if i have to get something like that, how much is it? How long it take to get it done? The Brow Feathering is $450 which includes your initial touch up done within 6-8 weeks of your treatment. Consultations are complimentary if you wish to book an appointment or start with a consultation please contact us 778-370-5200 or info@cecilbspa.com. We look forward to hearing from you.